How does the Content Ranking Index (CRI) work? Our Content Ranking Index will easily show how “visible” your website is in the Google results for the important keywords for your website. You will also be able to benchmark this and compare this to your competitors. Name your Content Ranking Index. The name will appear on all the reports. Enter the name of the domain you want to track. This can be your own domain name, but you can put any domain you want. Select the country you want to track your content performance. Add up to 30 keywords (phrases) that are the most important for your website. The Content Ranking Index will show you how “visible” your site is on these keyword(phrase)s. These are words/terms that are important for your business. If you need help to choose the right keywords, use our Keyword Analysis or Synonyms tool! The fifth step is optional. You can enter max 5 domains of your competitors so you can compare their performance. In this step you can set if you want us to update the Content Ranking Index automatically every week and which teammembers should receive an update mail. Of course you can manually update the Content Ranking Index whenever you like. Save your settings, your Content Ranking Index is created! Select the orange button ‘Update Content Ranking Index now!’ to get your first report. Please note that each update costs 1 credit (note: the amount of credits per update might be changed). It will take some time to generate the reports, in most cases a couple of minutes. The CRI is a score between 0 and 100. A higher score is better and means your overall visibility for the keywords you have set it better. 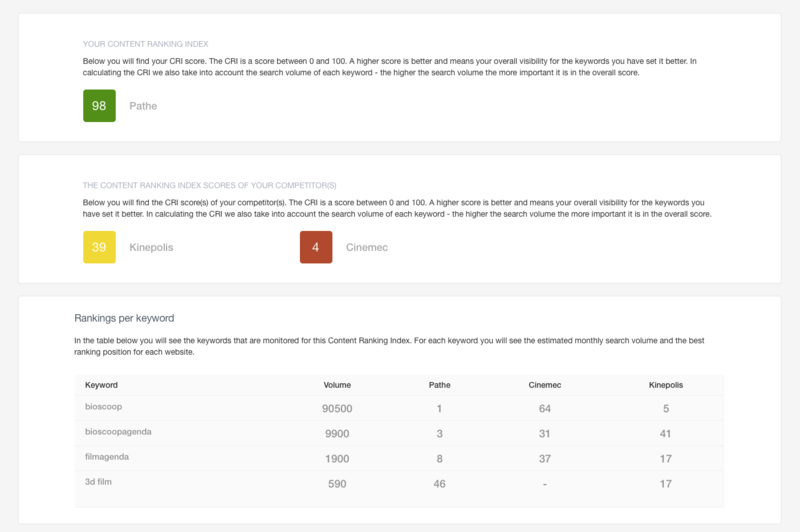 In calculating the CRI we also take into account the search volume of each keyword – the higher the search volume the more important it is in the overall score. For each keyword you’ve monitored you will see the estimated monthly search volume and the best ranking position for each website. In this part you can see what pages are ranking for the given keyword. The Content Ranking Index is based on the chosen keywords. Note: generating an CRI report costs credits from you creditbalance.